The former President will also travel to Florida to campaign for Andrew Gillum for Governor and Bill Nelson for US Senator…. Adams would be the first woman Governor of Georgia, and the first Black one if elected…. Gillum would be the first Black Governor of Florida if elected…. Georgia has had a LOT of voter suppression issues…. 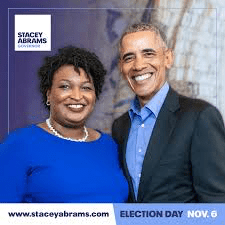 Obama previously endorsed Abrams, as did former President Jimmy Carter and Vice President Joe Biden. The former president will also be campaigning in Florida on Friday for Democratic candidates Andrew Gillum and Sen. Bill Nelson. ….